Facets is a very colorful and happy game! You play it in a room with up to four other players. Each person has their own board, and you can see all of the boards in the room! At first glance it looks kind of complicated. There are all these colors and triangles and eek!! What do you do? Don't worry! Facets is easy! Here's how it all works. 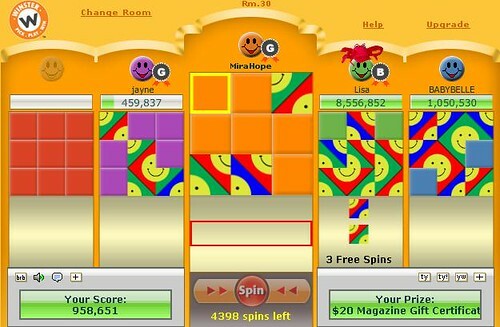 Your board is a 3x3 grid and you click "Spin" to get one piece at a time. (A single piece takes up one square in the grid.) You'll notice that each piece is divided into two brightly colored triangles, and each triangle has part of a smiley face on it. Like this! The goal is to make complete smiley faces! You can't split the triangles apart so you'll have to use your noggin a bit. Move pieces around by clicking and dragging them to a new spot on the board. 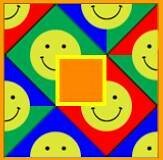 Whenever you make a complete smiley face the pieces will flash and then vanish, leaving you with Winster points! With the pieces gone you'll have room to make a new smiley and earn more points! You can also trade pieces with your teammates to finish faces faster! Just click on the piece you want to trade away and then click on the piece you want in return. The other player will see a Yes/No balloon pop up next to the piece you're offering. If they click "Yes" the pieces will switch places. That's it! If someone sends you a trade, you'll see a Yes/No balloon pop up next to the piece they're offering. You don't have to trade if you don't want to, but keep in mind that trading is a great way to earn points and make new friends! By now you've probably noticed that each part of a smiley face has either a red, blue, or green background to it. Believe it or not, the colors themselves are not important! What's important is how many background colors are in a completed smiley. Aim for a solid color background to earn the most points! In the following table there are examples of the different combinations. A solid color background doesn't have to be red! Oh, and don't forget that Club Winster members gets four times the points! Whenever you complete a smiley it's automatically submitted. No need for a "Cash In" button! This means it's quick and easy to make smiley faces, but you also need to be careful or else you might submit a 2-3 color smiley face instead of the solid one you were working on. Here are two easy tricks to keep you from slipping up. First, let's start with a nearly complete solid color smiley face. All we need is a bottom red corner! Since we really want a solid color background to earn the most points, we should probably do something to prevent an accidental smiley face. One way we can do that is to switch the top two pieces. When we find the fourth piece we'll pop it in place and switch the top two pieces back! Alternately, we could "block" the smiley face by putting in a piece that's turned a different direction. Like this! Once we find the fourth piece we'll just switch the two and get our points! Try both methods and see which you like best! 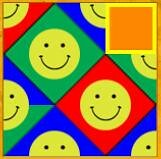 It takes four squares to complete a smiley face, so there's no way we could fit two faces side-by-side in our 3x3 grid. However, we can fit two faces in if we work diagonally! This is the double face pattern and it's very popular! The two faces share one piece in the middle, so you only need seven pieces (total) to make both faces! Here you can see the shared piece a little better. It might not seem like a huge deal, but think of it this way: It takes 100 pieces to make 25 smiley faces. If you use the double face method, you can make 28 faces out of those same 100 pieces! That's an extra 495 points for free players and a whopping 1,980 points for members of Club Winster!! Spread over time this really adds up! Say "Thank you!" and "You're welcome!" and say them often! At Winster we make it easy for everyone to be polite. Just hit the "ty" button to say "Thank you!" and the "yw" button to say "You're welcome!" It's such a simple thing to do but it makes a huge difference! If you never say "Thank you" you'll appear ungrateful, and people won't want to keep trading with you. Take a second to click the button and everybody wins! You've learned all there is to know! 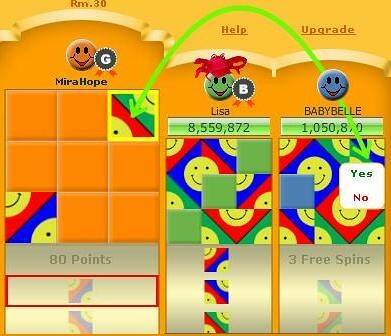 Are you ready to test your smiley face skills at Facets?